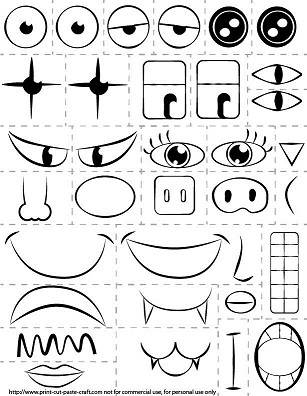 Printable Kids Activity: Make a Face/Exploring emotions. | Print, Cut, Paste, Craft! Printable Kids Activity: Make a Face/Exploring emotions. Back to winter and back to the long days at home. With the schools closed and the freezing temperatures outside this is a good moment to find some new easy printable kid activities to do! This easy to cut face can turn into hours of fun! Click here to download the face template and here for the parts template. If you want a more durable activity, print the parts on cardstock instead of regular paper. If you don’t have cardstock, don’t worry, paper will do just fine. 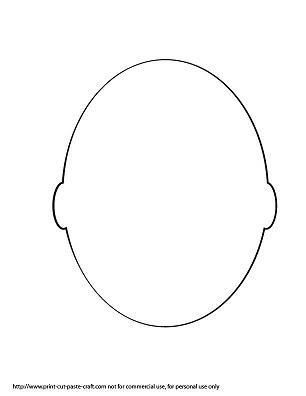 Have your child color the face parts before he cuts them and then have him cut along the dotted lines or help him cut them out. You can either: print multiple faces and glue different parts to make a gallery of different people or just place the different cardstock parts on the face and have fun! It can also be used to discuss emotions: prompt your child to create a sad face, a happy face, an angry face and a sad face. Try moving the eyes and the mouths in different positions to see how the face will change emotions! Awesome lesson idea. Any chance you could re-upload the hi-res files please? They appear to be down. I’ve used the preview image for the time being, amd when stretched to fit an A4 page it’s ok, but not ideal. Cheers! Links to downloadable content don’t work. Fix, please. thank you for letting me know. it seems to be working now.